I've been saving up a whole hamper of Christmas goodies. Firstly, we have a list of free paper models for fantasy, modern and Sci Fi, a computer tool for generating city maps at the click of a button and more tables than you can shake an entire tree at. Put down that shotgun, there's no need to raid that local supermarket to pay for your embarrassing RPG addiction, get stuck into some of this. Some people like lead. Some people like mild steel. Others like vulcanised rubber. For those of us who just like free stuff, there are paper minis. Paper minis are download-print-cut-fold and stick. Of course, with the help of a responsible adult. Looking at my player group of 20 and 30 somethings, responsible adults are in short supply! I like the idea of paper minis: you can squash villains with a fist, if tried with their lead counterparts would result in a trip to hospital and a rather embarrassing explanation of why a skeletal necromancer is embedded in the side of your hand. Here's a selection of places where you can get hold of paper minis, from little people through to buildings and other wargamey goodness. D&D Buildings by Wizards of the Coast, a company I love and hate equally, have 13 paper buildings for your Dungeons and Dragons campaign. Scaled correctly for your standard 35mm miniatures but you could use smaller by reducing the print size. Tiles, Houses and Heroes by Microtactix. Amongst the non-free stuff (scroll down) you'll find free gems of little buildings, modern and fantasy and fold-able characters. Smashing. I like the little WW2 houses in particular. Spaceships, rockets and fighters by Erick Muñoz are a Science Fiction delight. A range of ships (mostly from the PC Game Homeworld) can be used for just about any Sci Fi and they are of exceptional quality. No doubt, you'll have to have some skill to make these. Those with cack-handed boxing gloves on the ends of their arms like me might turn out abstract beauties from these highly detailed paper models. Horror selection from Raven's Blight has a ghoulish array of ghost houses, coffins, zombies and vampires. 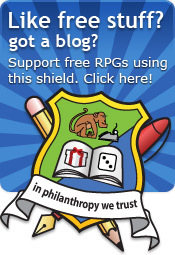 They lilt toward the cartoony but I think Cthulhu aficionados will find something here to amuse. Star Wars and Star Trek models at Skip's Paper Sci-Fi has 8 lovely ships that might require quite a lot of work but are free and splendid nonetheless. Star Trek mini maker by Wayne Peters is a super tool where you select body, clothing, hair, gadgets and so on. The builder makes the mini right in front you. What a great idea. Character paper minis in Arion Games's freebie section has a few PDFs of free minis. It's something of a hodge-podge but they minis are beautifully presented. I think it might be clever marketing by free sample but that's ok. They're rendered images, which is a nice change and makes the Sci Fi ones particularly good. Cartoony everything at Oversoul games amongst a raft of fabulous freeness (all on the list for future reviews) are some lovely cartoony miniatures. Dr Who minis by Craig Griswold, the same chap who gave us Into The Shadows has offered some smashing little minis. Ok, you might not want to use the ones that look just like the Doctors but the bad-guys, assistants and so on are generic enough to use in any moder game. 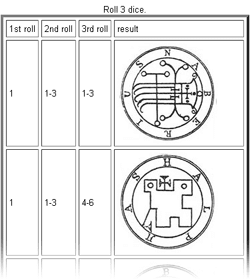 Font based minis by S. John Ross from the creator of Encounter Critical (the system behind the barking mad Asteroid 1618) gives us a bunch of fonts that are laid out for minis. You need to do a little more work than the PDF ones but I love them! [Added! ]Fantasy characters and monsters from Age of Fable who has collated a number of Order of the Stick inspired minis for your printing pleasure. Inspired they are. Nice work all involved there. Obsessive cartographer types, avert your eyes! 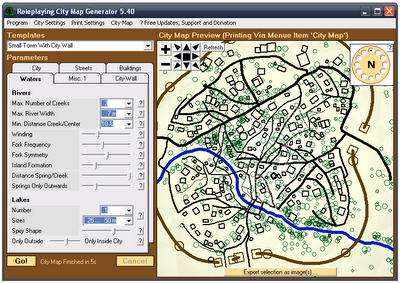 The City Map Generator is a Windows application that creates beautiful maps of cities at a click of a few buttons. Within a few moments, I had managed to create a city with buildings, rivers, a wall, plant life and more. Sadly, the website that it was home to has disappeared off the web (original here) but the downloads are available across the web. The maps do look a bit samey but then I'd argue that most fantasy/historical towns do. You can export to different formats for labelling streets. Even looking at my fiddling-about test runs, I can see mugger's alleys, bustling thoroughfares and market squares. And that's my Sci Fi addled mind. We can only hope that the original developer (who goes uncredited on the application) pops up and says hello, because I'd love to congratulate and thank him/her/them/it. My next article will be published in the new year, I do hope you all have a fantastic holiday season and see you again in 2009. Have a happy holidays and thanks for all the free stuff! You're welcome, chgowiz! The new year is looking to yield some more classics! Excellent and much needed blog. I hope to see it continue through the new year. Many thanks, Norman! I will certainly try to keep things going. There's plenty of free stuff left to review. Also, I missed some more paper minis from Age of Fable. Smashing stuff.